In light of recent research showing the once-abundant little brown bat in grave danger from white-nose syndrome, the Center for Biological Diversity and allies today asked the Obama administration to investigate whether the species needs federal protection. The study revealed that this deadly bat disease could soon drive the glossy-furred, sharp-toothed little brown bat to extinction in the Northeast in just two decades — and maybe sooner — even though it’s always been one of the most common bat species in North America. Until the exact level of danger to the little brown bat is known, we’re asking the government to place the species on the Endangered Species list as an emergency measure. Since the discovery of white-nose syndrome in 2006 in upstate New York, it has already spread to 14 states and two Canadian provinces and killed more than a million bats. In some affected colonies in the Northeast, white-nose syndrome mortality rates have reached almost 100 percent. And scientists estimate that the loss of bats to white-nose has resulted in an astounding 700 fewer tons of insects consumed per year — not good news for humans or their crops. But since the U.S. Fish and Wildlife Service has yet to develop a concrete plan to confront the devastating disease, we’re asking you to join our call for real, immediate measures to fight it nationwide. Read more in our press release and take action now by demanding the federal leadership we need to save bats from this crisis. The U.S. Fish and Wildlife Service’s National Wildlife Refuge System has decided to close caves and mines and implement research and monitoring protocols in a nationwide effort to slow the spread of white-nose syndrome (WNS) in bats. Acting Service Director Greg Siekaniec issued the guidance in a memo dated Sept. 2, 2010. Caves managed by the Service in the Southeast were closed last year in an effort to slow the spread of white-nose-syndrome in bats. First documented in New York in 2006, WNS has spread rapidly across the eastern United States, killing more than one million bats. 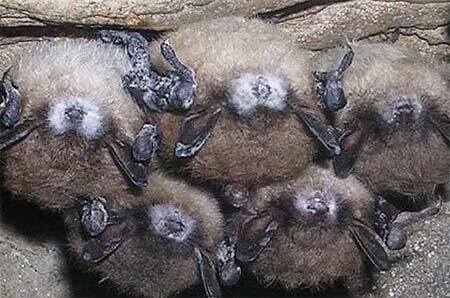 Named for the white fungus that appears on the muzzle and other body parts of hibernating bats, WNS is associated with extensive mortality of bats in the Northeast. 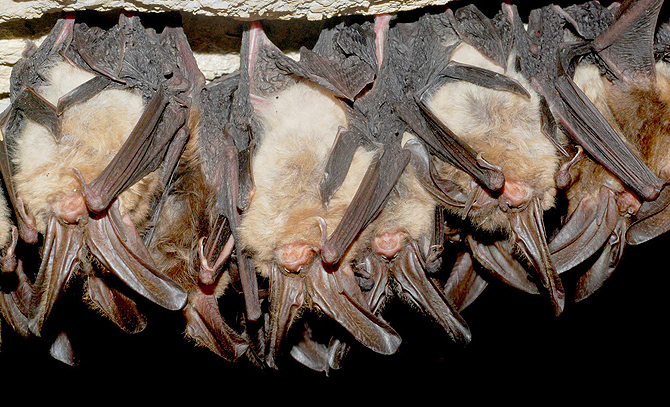 Bats with WNS are found to exhibit uncharacteristic behavior during cold winter months including flying outside in the day and clustering near the entrance of hibernacula. More than half of the 45 bat species living in the United States rely on hibernation for winter survival. Four endangered species and subspecies of hibernating bats in the U.S. are already affected by or are at risk from WNS. The fungus associated with WNS, Geomyces destructans, has been detected as far west as Oklahoma, and is expected to continue spreading. While the fungus is transmitted primarily by bat to bat contact, biologists suspect it could be transmitted inadvertently by humans. Fungal spores can be transferred from cave sediment to clothing and instruments, and transported to unaffected sites. The Service is leading a cooperative effort with federal and state agencies, researchers, universities and other non-government organizations to research and manage the spread of WNS. A 2008 study determined that the fungus found on the muzzles, wings, ears and all exposed skin tissues of infected bats is becoming common in colder climates. The fungus is a cold-loving fungus and only grows at temperatures below 20 degrees centigrade and therefore only grows on the bats when they are hibernating in caves and mines during winter. The fungus appears to disrupt the normal patterns of hibernation causing bats to arouse too frequently from torpor and starve to death. The symptoms associated with White Nose Syndrome include, loss of body fat, unusual winter behavior (flying around), and death. Because no one yet knows how the condition spreads, cave management and preservation organizations have been requesting that cavers limit their activities and disinfect clothing and equipment that has been used in possibly infected caves. In some cases, access to caves is being closed entirely. Despite these efforts, the spread of the disease to Aeolus Cave, New England’s largest hibernaculum which has had limited human access since 2004, “complicates” the theory that human activity is directly contributing to the condition. It is likely that both bats and humans can spread the fungus. On 12 March 2009, a Greater mouse-eared bat found in a cave showed the telltale white nose. It was captured, and a sample of the fungus was taken. Both morphological and genetic tests showed that the bat in France was infected with the same fungus infecting bats in North America. Because this individual bat was not underweight, in contrast to infected bats in the U.S. and Canada, it is thought that the fungus is either native to Europe and local bats have a resistance to it, or that the fungus is not the root cause of WNS and the original pathogen is not present in Europe. Part of this story ran in the US Fish and Wildlife Services website on Sept 16, 2010.